Theater chain AMC has created a quick basic primer to familiarize viewers with the nation of Panem, as seen in The Hunger Games: Catching Fire, which opens today. The illustrated guide is just a general overview of the 12 districts, identifying the chief industries and the past victors (if they have names) returning for the third Quarter Quell. I want to wish a very happy birthday today to one of the most talented, beautiful and underappreciated actresses in Hollywood, Jena Malone. To help celebrate, here is a gallery of Jena looking gorgeous while promoting her newest film, The Hunger Games: Catching Fire, in which she plays the crafty and deadly Johanna Mason. When Catching Fire opens tomorrow, I hope it proves to be the breakout role that Jena has been waiting for; the one that really puts her in the spotlight. She has been acting and winning awards ever since she was a child, but has yet to really break through into the public’s consciousness. May the odds be ever in your favor, Jena! Finally, we get a new promotional photo for The Hunger Games: Catching Fire that includes Jena Malone’s Johanna Mason! I know that Katniss Everdeen is the lead character in this flick, but — even setting aside my obsession enthusiasm for Jena — I’m surprised that Johanna is not getting a big push, since she is probably the most popular new character from the sequel book. Okay, you can probably make a case for Finnick, but he’s pretty front-and-center in the promotional campaigns. I was at the New York Comic Con this past weekend, where the Catching Fire booth included a display of character Barbie dolls, and who do you think was represented? Katniss, Peeta, Finnick and Effie Trinket! No Johanna. (Interestingly, the Peeta doll is the same height as the Katniss.) Let’s see a little more love for Johanna, people! District 7’s Johanna (Jena Malone) practicing with her axe while District 1’s Cashmere (Stephanie Leigh Schlund) and Gloss (Alan Ritchson) look on. 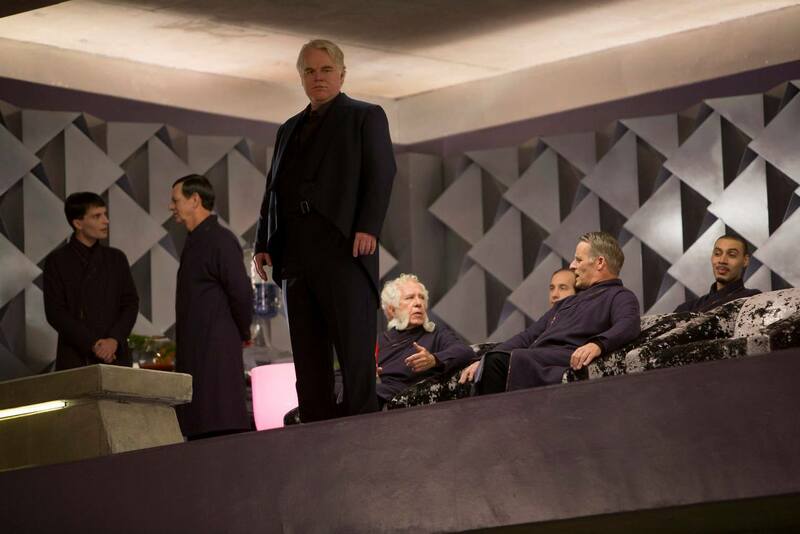 The Gamesmakers, including Plutarch Heavensbee (Philip Seymour Hoffman) front and center.